Each fall since 1950, the American Association for Laboratory Animal Science has held its annual National Meeting. During the five days of the meeting, members and nonmembers come together to enjoy the workshops, lectures, poster sessions, and exhibits. The AALAS National Meeting is the largest gathering in the world of professionals concerned with the production, care, and use of laboratory animals. 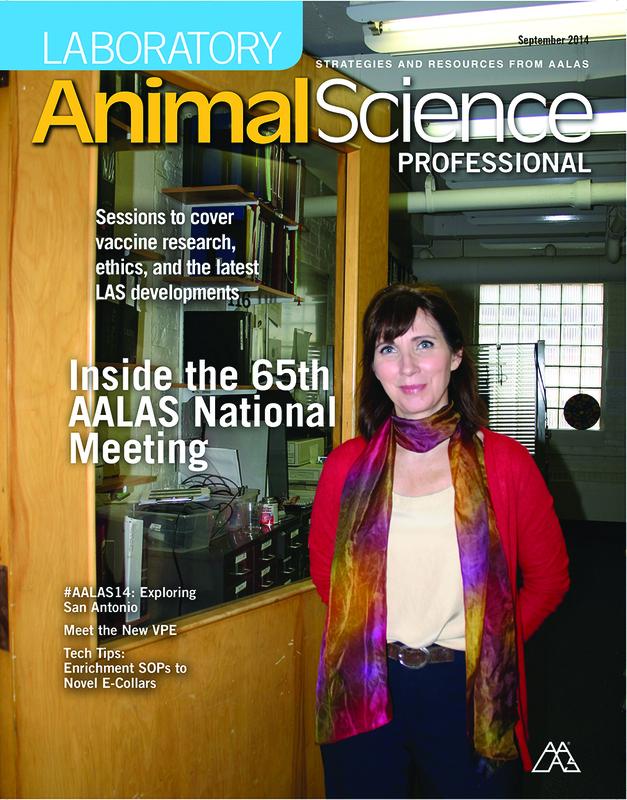 The September 2014 issue of AALAS’ signature publication, Laboratory Animal Science Professional, focused on the upcoming 65th National Meeting to be held in San Antonio, Texas, October 19-23, 2014. The magazine was delighted to publish an article from Allyson J. Bennett, this year’s Charles River Ethics and Animal Welfare Lecturer. Dr. Bennett shared thoughts from her upcoming lecture and was featured on the magazine’s cover. “Time for a Change?” by Dr. Allyson J. Bennett appeared in Laboratory Animal Science Professional, September 2014, and is reprinted by permission. Public interest in animal research and welfare extend well over a century, with deep roots in different views of moral action, and the power to ignite highly charged emotional responses. Public interests are of two kinds: One is as recipients of the benefits that research delivers. The other is as decision-makers whose actions and views shape the social contract and conditions under which animal research is done—or not. Decisions about animal research have consequences at societal and individual levels. As a result, serious consideration of the facts, inherent moral dilemmas, and future of animal research should extend far beyond the research community. What we often see instead is public interest in laboratory animal research represented not as the complex thing it is, but rather as a simple split: scientists on one side and animal rightists on the other. Logic versus compassion. Harm to other animals versus benefit to humans. Saving sick children versus hugging puppies. Heroes versus villains. In this cartoon vision, opponents stand at an unbridgeable gap armed with different conclusions from facts that may, or may not, overlap. Each argues their case to sway the public, legislators, media, and youth to “their side.” This approach persists despite the long history, complexity, and critical importance of animal research to public interests. Often animal research discussions begin and end without thoughtful dialogue, or even full acknowledgement, of what gives rise to opposed positions. Most obvious is the divide over whether animals should ever be part of research and, if so, which animals and for which purposes. Less obvious are some fundamentally different understandings and visions of how science works, how deeply it is woven into more than a century of profound changes in health, environment, and technology and out understanding of the world. Scientists, laboratory animal research community members, advocates, and educators can play important roles in advancing the public dialogue beyond old and polarized scripts. Conveying accurate and substantial knowledge about animal research is a primary responsibility. We can share why we believe the lines of division are false, why identifying heroes and villains falls short, and why we should reject the science versus compassion formulation. We can contribute to the dialogue with specific examples illuminating why it is wrong to cast the issue as science versus animals, or to divide along the lines of those who conduct the work and those who protect the animals. We can demonstrate that scientific study is responsible for much of what we understand about other animals and for advancing better animal welfare. Animal research has fostered better medical treatment, conservation strategies, and care for other animals. At its heart, the purpose and motivation for animal research is the drive to reduce suffering and improve human and animal health. There is no compassion in ignoring the suffering of humans and animals threatened by Ebola or any other disease. Nor should a small, privileged segment of global society make decisions that disregard the world’s population, animals, and environment. As knowledge, need, and perspectives continue to change, these and other topics will be central to advancing a deeper consideration and informed dialogue that can protect public interests in animal research. This cannot be the job of scientists alone, nor does it require information and expertise available only to scientists. It may require additional effort from all of us to better understand the topics, core moral issues, and consequences of different courses of action. It will require time and change to place serious and full consideration of these issues at the center of public dialogue, but it is time well spent to move forward in addressing the difficult choices and challenges we encounter as we seek to improve a shared world. Posted on September 12, 2014 September 12, 2014 by EditorPosted in News, Outreach NewsTagged Allyson Bennett, Laboratory animal science, Time for a change. I think we’ve come down to a semantic argument that isn’t going to be settled. I believe she implies that the vast body of scientists support animal research, you believe she has implied that every single one does. Those who deny climate change is man made are regarded as quacks. The same is true of those who deny all animal research can provide any benefits. I don’t think the scientific community should be supporting other scientists who talk nonsense. So what you are saying is that the fact that she is implying that all scientists support animal research is fine because “the vast majority” of scientists do and for that reason it is okay for the writer to imply that if you are against animal research you are against all science. Hence also implying that scientists that are against animal research or have compassion or believe in animal rights cannot be scientists because they are in direct contrast to science, scientists, our understanding of the world etc. The fact that you are fighting to protect this concept so strongly does seem to confirm this and the fact that most (every?) scientists that has publicly spoken out against animal research has been made out to be a quack with no credibility on this site also seems to confirm that once you do speak out against animal research there will be strong attempts to cast out by the scientific community. There are many scientists that do not agree with animal research and just because animal research scientists follow the scientific method does not mean all scientists support animal research. If climate change research was something that some scientists had moral issue with then I would expect people writing articles about climate research would take more care not to group all scientists as climate researchers. Would you feel the same if the article was about Nazi scientists experimenting on humans and the author wrote: “scientists on one side and human rightists on the other”? No, not all scientists agree with animal research – the vast majority do. Not all scientists agree with man-made climate change – the vast majority do. In both cases we refer to the vast body of people involved as scientists doing science. Moral objection is irrelevant – they are still scientists doing science. If the overwhelming majority of scientists agreed with Nazi science (which thankfully they don’t), then yes – it would be scientists against human rightists. This seems very much your interpretation. Those doing animal research are scientists. What they do is science. When we discuss climate change we often talk about “the science” as being behind a need to reduce CO2 levels. Those doing the study are scientists. We do not need to refer to it as “climate change researchers” and “climate change research” every time in an article on a climate change website for people to understand that every scientist does not deal in climate change. Animal researchers are scientists, animal research is a form of scientific research, and animal use is a major part of life sciences. She is talking about all science -and the misunderstanding relating to scientific method, and how that affects our perception of what goes on in animal research (which follows that same method). Interesting article touching on some important points. I just wish the author would not equate science, scientific research and scientists in general to animal science or animal research. Science and scientific research can and does exist without the use of animals.